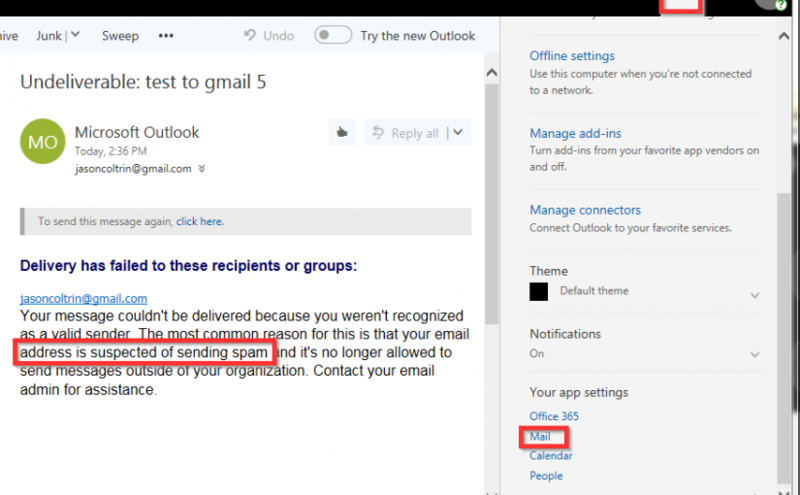 Recently a client complained that an Office 365 account had sent out spam messages to a number of clients. Later, the suspect account which had been sending spam could no longer send or receive email. However upon first glance at the mailbox, sent messages were sitting in the sent items folder, and messages sent to the account in question were not receiving bounce-back failures, but the messages sent to the affected account were not in the inbox. After we changed the password to the account, and enabled 2FA on the account we could still not send and receive mail. Below are the steps used to resolve this particular issue. 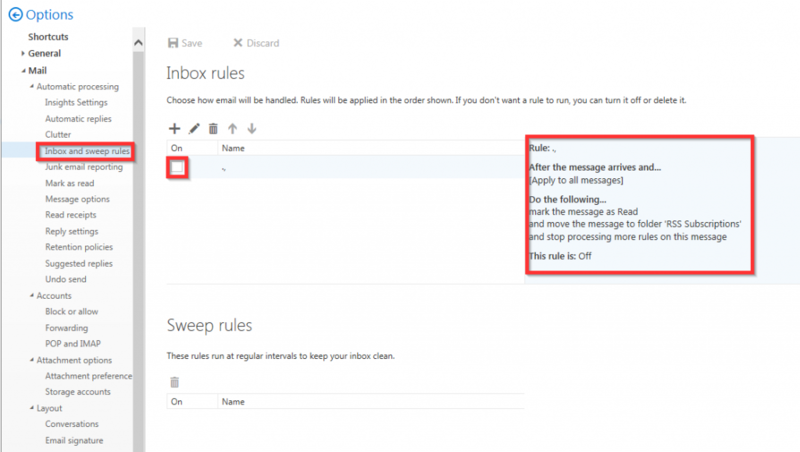 In short, a malicious inbox rule had been created and outbound messages had been blocked by Microsoft. 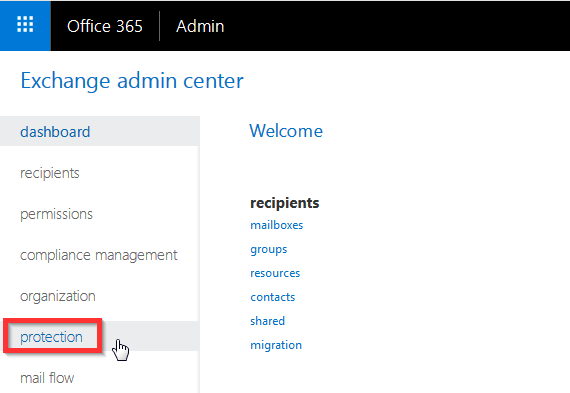 Log into the tenant’s Admin console with an Administrative account, and change the password of the affected account. Log into the affected account as the user using the new password. Click on the Gear icon and then under Your app settings, click Mail. 4. 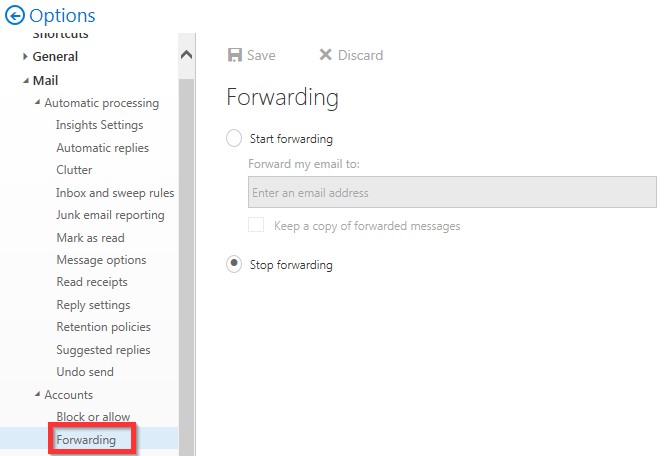 One in the Mail app Settings, go to Mail > Automatic Processing > Inbox and Sweep rules. 5. Uncheck and turn off any malicious or invalid rules. Your message couldn't be delivered because you weren't recognized as a valid sender. The most common reason for this is that your email address is suspected of sending spam and it's no longer allowed to send messages outside of your organization. Contact your email admin for assistance. 8. In the Action center, we’ll find an issue flagged regarding our hacked user account. Take action on the issue and after a while due to permission propagation, it may take up to 2 hours for the account to be re-enabled for sending mail again. 9. 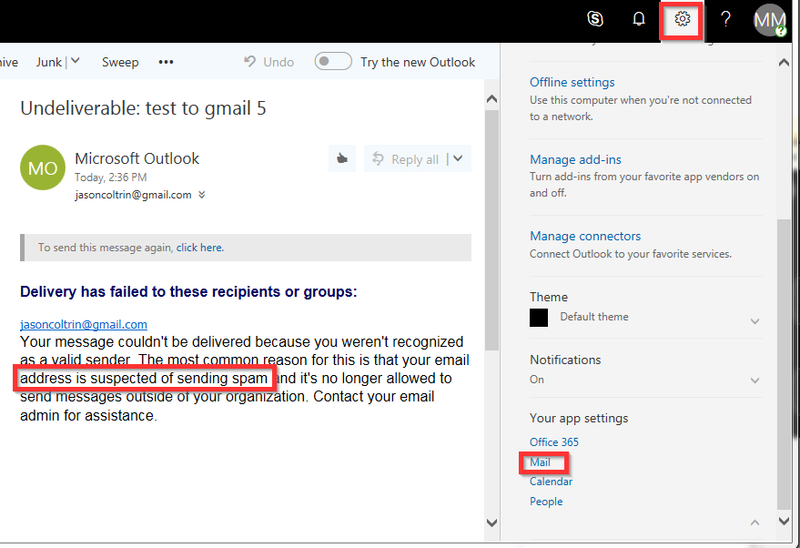 It might be a good idea to contact Microsoft Support if you continue to experience problems with a user account sending spam. Changing the password should prevent malicious access. Most like the account had been phished or the computer the user has was compromised by a virus/malware or spyware. 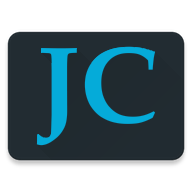 It’s recommended that the account have two-factor authentication or multi-factor authentication enabled to prevent the account from being hacked again. Apparently I am approved for a large loan for my business, although I don’t even own a business… block these numbers too: 281-806-5695 , 725-696-3397 from yesterday, and from the day before, 650-722-1909 . I wonder why I seem to be getting so many of these spam phone calls when there are heavy penalties for violating the “Do not call” list? Time to check the National Do Not Call registry again and re-register. If you’re also getting annoying spam calls from these numbers please go to https://complaints.donotcall.gov/complaint/complaintcheck.aspx and file a complaint.